Well, I rang my mom and dad yesterday to tell them that I've decided to stay on in Dublin for another while. I may be in my 20s, but I still feel anxious and nervous about disappointing them. Their idea for me was always that I be a teacher, either high school or university, and the thought of me take a year out at my relatively advanced age to work for minimum wage at a restaurant makes them really mad. My argument is that a year is just a year, and I've basically been in education all my life and at this point need a break to assess things and consider whether I really want to commit to another 40 years or so of school -- even in a new role as a teacher. I've really enjoyed all the academic stuff here in Dublin and, honestly, it's been absolutely fantastic studying literature in one of the most literary cities in the English-speaking world, but I do know that it's also not the real world. Bottom line, it won't do me any harm to have to work hard and not earn a lot for a year or so before making some big decisions about the rest of my life. And there's just something about this place that's gotten under my skin. It's not that Dublin's perfect because it's not, and nowhere really is, but there's an energy and a love of language and music and art and fun that's just so refreshing and unpretentious and different to anything I've come across in other places, and it's hard to think of leaving. Sure, there are things and people I miss from home, but more and more I've realised that if I leave Dublin, there are even more things and people to miss from here. [Sniff]. The good news is that most of my friends from back home are also finishing up either college or their first couple of years at work, and my inbox is flooded with emails from people planning to come and visit! Which now that the dissertation is basically finished is a great prospect, and a good opportunity to go look at the places I haven't been to yet, or visit some old favourites like Dublin's best kept secret, Marsh's Library. I wrote yesterday about how I was going to see a dance show. 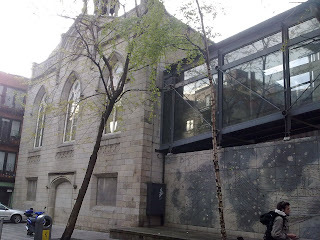 The venue was another part of the Smock Alley Theatre. That's in in the picture above. It seems to be a venue full of surprises. On the other side of the block you have to walk through a sort of warren to get to the theatre space. This one does have a more impressive outside. Oh! Gotta go; my flatmate is calling me for another lesson in Italian cooking. Tonight: homemade pizza. Wow, what a gorgeous weekend. Yesterday, I met up with my galpal Saoirse and a couple of her friends, and we went for a hike in the Wicklow mountains. It's ironic, because I actually love Dublin, but one of the things I really appreciate about it is the fact that you can leave it so quickly. Well, at least you can outside of the commuting rush. And the mountains are, like, right there. You can see 'em from the city, but at a distance they don't look so special and there's no way to know just how beautiful and wild and extraordinary they really are. We hiked around a lake -- two lakes, actually -- Lough Dan and Lough Bray. The sky was blue, the sun was shining and from the top of the mountain we could see all the way to the sea and the girls told me that on a *really* clear day, you can see to Wales. I couldn't believe just how gorgeous it all was -- and it was also hard to understand how come the place wasn't just full of people (tho' it's definitely best like that -- you can pretend you're totally in the middle of nowhere). While it wasn't exactly rock climbin (I actually saw a little boy doing the walk) we felt very exercised afterwards, and all the way back into town I kept thinking: "This is it! I'm going to move to the countryside and raise chickens and cows!" Then we got back and reality sank in. But still, to know that when I need a fix of the wilderness, it's just half an hour away is good. Honestly, I think a lot of Dubliners just don't appreciate what they've got right there, on their doorstep. There's a neat place out there, too, called the Glencree Reconciliation Centre. All I can see is, if anything's gonna put your mind on reconciliation, it's being in such a beautiful spot.